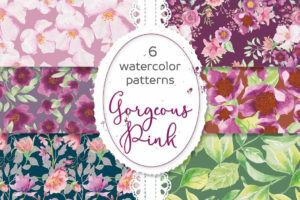 Set of 6 watercolor papers in pretty pastel, floral designs, creating a shabby chic look! These are seamless patterns made with hand painted flowers and foliage. The patterns are given in both PNG (transparent background) and JPEG file formats. The JPEG files have a color background. The PNG files are ideal for adding the background of your choice: choose your own color or add a distressed background for a vintage look. 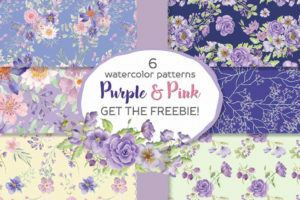 The patterns are great for scrap booking projects, card making for weddings and other events, decoupage, and printing on any surfaces such as fabric and paper. Patterns are given in JPEG and PNG file formats. The JPEG files have a color background. 1 zipped folder is immediately available for download following purchase, containing the 6 patterns (JPEG and PNG) – 12 files.